General Characteristics: Short, moderately spreading, stocky, maturing within 6 to 9 months, producing from 10 to 15 oha; resembles Apuwai very closely, the latter having a more crinkled leaf blade and a deeper-set piko. Petiole: 40 to 60 cm. long, rigid, light green with inconspicuous greenish edge, white at base. Leaf blade: 45 to 55 cm. long, 35 to 40 cm. wide, 35 to 40 cm. from tip to base of sinus, horizontal, ovate, somewhat cupped, light green; piko light green; lobes obtuse, frequently overlapping, with deep, narrow sinus. Corm: Flesh chalky white with inconspicuous yellowish fibers; skin cream-colored. Origin, and derivation of name: Native variety; it derives its name from the fact that the leaves are somewhat cup-shaped. 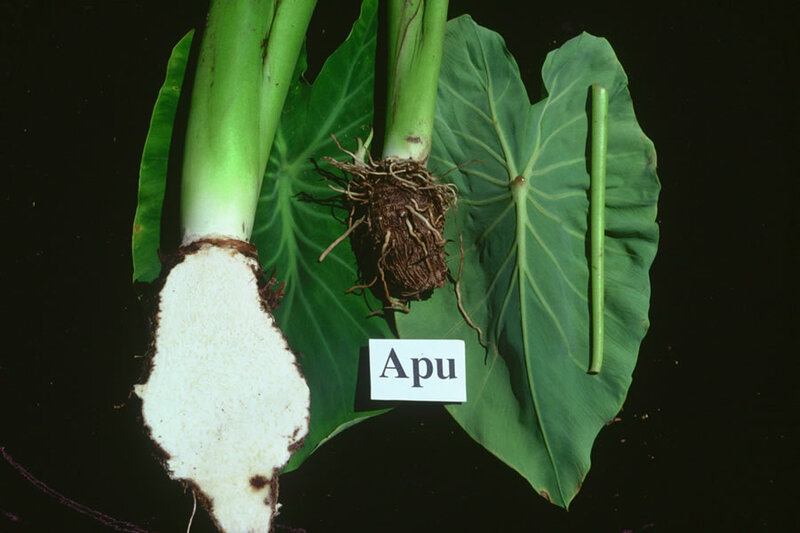 Distribution: A little-known taro at the present time; the only planting found was on Maui.